1. Preheat the oven to 200C/Fan 180C/ Gas Mark 6. Heat half the olive oil in a frying pan, add the Portobello mushroom, season with salt and pepper and add one of the garlic cloves and thyme. Cook for about 45 seconds on each side then transfer to a baking tray. 2. Bake for 5 minutes. Transfer to a plate - gill side down, along with the garlic and thyme, cover with cling film and allow to cool. 3. Reduce the oven to 190 C Fan170C/ Gas mark 5. Return the pan to the heat, heat the remaining oil, add the shallot and the rest of the garlic and sauté for 2mins. Add the mixed mushrooms and sauté for about 2mins before tipping into a colander - reserve the juices. Mix the herbs with the mushrooms and season to taste. Leave to cool. 4. Place the butter, flour, reserved liquid from the mushrooms and the stock in a pan and slowly bring to the boil, stirring with a balloon whisk until the mixture boils and thickens. Cook over a gentle heat for 2mins. Remove from the heat, add half the cheese allowing it to melt in slowly. Stir in the sauté mushrooms and herbs and season to taste. 5. Unwrap the filo pastry, brush the top sheet with butter then place it on the work surface, repeat laying the second sheet at right angles to the first. Repeat with a third sheet so you have a stack of 3. Repeat to make 3 more stacks in the same way. 6. 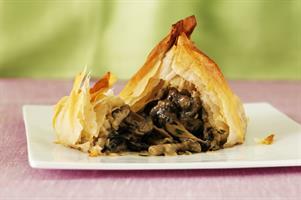 Place a mushroom in the centre of the pastry, pile the mushroom mixture on top along with the remaining cheese. Gather the corners of the pastry up around the mushroom to enclose the topping, seal with butter - you want to get a pyramid effect leaving the leaves as tall as you can. Drizzle over any remaining butter. Bake on a baking sheet for 15mins or until the pastry is golden brown and crisp. Serve hot. • Combine a little truffle oil with the melted butter the give a wonderful aroma when cooked. • Use Emmenthal or gruyere instead of Beaufort. • This dish can be made with thin poppy seed crepes instead of filo pastry. • Try using two sheet of pastry and sprinkle with chopped pistachio nuts and then seal with the second sheet to give extra texture. • Serve with a spoonful of peppered crème fraiche to accompany. • The addition of port, Madeira or sherry when sautéing the mushrooms will amplify their flavours.